In Florida, we don’t really get a winter anymore. We get a couple very cold days peppered in amongst 65 to 75 degree days until late April when it goes nuclear again for 10 months. Today, it’s the kind of cold where you strategize going to the bathroom. “If I just carry the blanket down the hall with me and drape it over the door to the neighboring room, I’ll only be out from under it for approximately 1 minute 38 seconds. It’s the kind of cold where I’m actually wearing socks, pants, and a hoodie indoors (yes, it’s a Nationals hoodie. So are the pants). Ask anyone who knows me, and they’ll tell you that borders on arctic. My greyhound’s feet are like ice cubes. We’re babies here in the Sunshine State. I won’t deny that, but the occasional cold day gives us a reason for comfort food. It’s the only time we can stomach things like tomato soup and grilled cheese, homemade macaroni and cheese (who am I kidding? This is always a good idea), big vats of stew or soup, pot roast, chicken pot pie, or hot chocolate. Otherwise, it’s too hot to both make and consume these things. Today, though, is perfect. 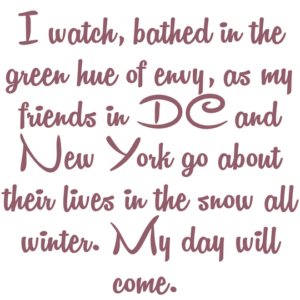 It’s never cold enough for me down here, and I watch, bathed in the green hue of envy, as my friends in DC and New York go about their lives in the snow all winter. My day will come. I am the Abominable Snowman. I love the cold, and I love the food that comes with it. Today’s breakfast was simple and filling and a perfect start if you’re cold. Sure, I ate it at 12:15, but isn’t it still technically breakfast if it’s the first meal you eat? 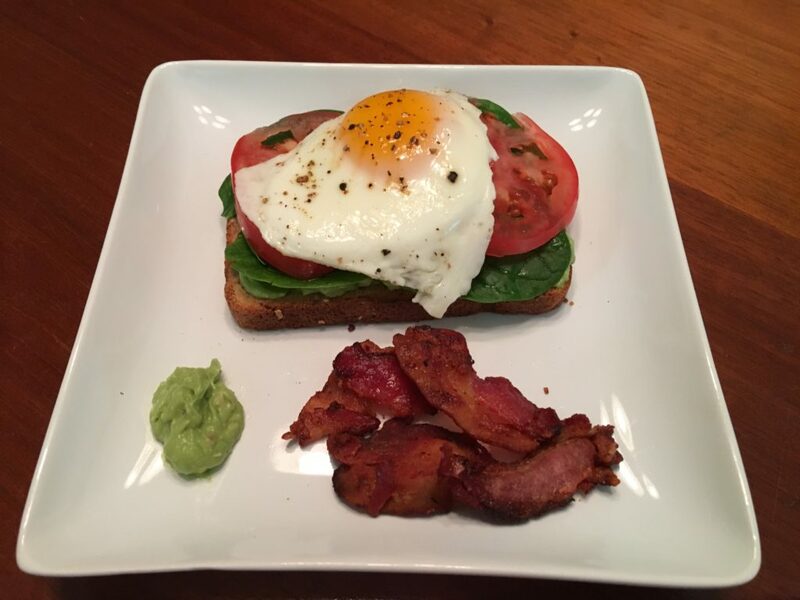 A slice of 12 grain toast topped with mashed avocado, baby spinach, tomato slices, and what I always knew as a “dippy egg” but found out later not everyone calls them that. Add a side of bacon (if I break it up into halves, I technically didn’t eat as much, right? ), and a dollop of extra avocado, add some bad lighting, and voila! It’s since warmed up to a nice, mild 42. A friend of mine from New York is trapped here in Florida thanks to the weather (and yesterday’s horrible shooting in Fort Lauderdale), and another one is spending his first winter in DC. I wish I could have shared this with them. Tonight, we’re doing chicken and wild rice soup. Update tomorrow. What’s your favorite cold weather food?